« What is a scholar to do when there is no agreement on the basics? I begin with Gullotta’s point. By associating the Philo argument for a pre-Christian celestial Jesus with the inspiration for Carrier’s mythicist view (Doherty’s “central idea”), by making it the first of his six criticisms, and in couching it in excessive rhetoric (“the most damning argument” … “within the entirety of the Mediterranean world” … “that validates the existence of this pre-Christian celestial Jesus”), Gullotta catapults the significance of this discussion well beyond its actual place in Carrier’s thesis. In fact, Carrier could have omitted this entire section from his book without significantly lessening the overall strength of his argument. Carrier’s assessment of Philo’s interpretation of Zechariah (with its apparent indication of a belief among some pre-Christian Jews in a heavenly figure of Jesus) is #40 in a total of forty-eight items of background information that a historian needs to keep in mind when interpreting any particular piece of evidence in the exploration of Christian origins. Background information is used to contextualize evidence. It is not the focus of the argument itself. It is therefore misleading to single out such a point and criticize it as if it were one of the planks or significant steps or key pieces of evidence in Carrier’s assessment of mythicism. It is one of 48 bricks in the wall against which the evidence is weighed. If it were missing entirely from the book Carrier’s final argument would not be greatly affected, I believe, since there is more than sufficient evidence within Paul’s letters and other Second Temple writings to sustain the conclusion of On the Historicity of Jesus. (2) in classical studies – that a common name like Jesus could indeed be associated with divine figures (see John Moles). Either possibility renders less than absolutely “damning” the arguments he mounts on the basis of “a prosopographical analysis of the names” of Second Temple angels. Now to Carrier’s presentation of the Philo-Zechariah argument. I said I also find myself at odds with Carrier on this point. Gullotta cites an earlier publication by Carrier, “Bayes’s Theorem for Beginners: Formal Logic and Its Relevance to Historical Method” in Sources of the Jesus Tradition: Separating History from Myth (2010), and I will address Gullotta’s citation in a future post. At this point I will quote another section overlooked by Gullotta, and (dare I suggest?) by Carrier in OHJ, too ….. In Bayes’s Theorem . . . all the probabilities in the equation are conditional probabilities — conditional on the truth of our background knowledge. Therefore, only background knowledge should be included . . . not background assumptions or mere beliefs. Indeed, the very difference between professional and unprofessional history is the acceptance in [background knowledge] of only what has been accepted by peer review as an established fact (or an established uncertainty of some degree, as the case may be). So the contents of [background knowledge] should be limited to the confirmed consensus of expert knowledge. Other criticisms of Gullotta to be addressed in future posts. Carrier, Richard. 2010. “Bayes’s Theorem for Beginners: Formal Logic and Its Relevance to Historical Method.” In Sources of the Jesus Tradition: Separating History from Myth, edited by R. Joseph Hoffmann. Amherst, N.Y: Prometheus Books. Posted on 2018-08-09 12:04:16 GMT+0000 by Neil Godfrey. 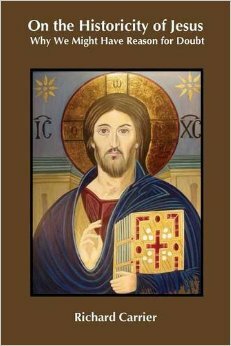 This entry was posted in Uncategorized and tagged Carrier: On the Historicity of Jesus, Daniel Gullotta, Gullotta: On Richard Carrier’s Doubts. Bookmark the permalink. Is Gullota still at it? Didn’t he say, during his “debate” with Fitzgerald a couple of years ago, that he wasn’t engaging mythicism any more after that? He’s so bad at critiquing the myth theory and at defending historicity that i applauded when i heard him say he wouldn’t go there any longer. Help me out. The first believers in the Jesus savior cult were Jews, right? The Jews of the second temple period were divided into several sects who were antagonistic to each other regarding many things; each asserting that their particular methodology and practice were the “proper” ones. This is patently evident from the Qumran materials. Philo’s description of the logos does coincide abundantly with many of the most salient attributes assigned to the Jesus character and is presented as evidence that the existence of such a heavenly entity was not antithetical to authentic Jewish practice and belief. Whereas the concept of the human embodiment of God was. So, how is Carrier overstepping his bounds in including this as a background element in the larger analysis? The sticking point for Hurtado (it appears to me that Gullotta took his core criticisms from Hurtado) is that Carrier interprets Philo as speaking of a specific heavenly angel figure called Jesus. That may be a possible interpretation of Philo’s text but it is nonetheless at least debatable, I think. The principles you point out — Philo’s logos sharing attributes of Paul’s Christ, etc — are certainly justifiable background information. The distinguishing characteristic of a Christian sect would be the archangel Jesus having died. there probably were pre-Christian sects (one of which probably became Christian, by novel revelation) that did revere the archangel Jesus and probably even taught he would be the coming messiah, but had not yet come to the conclusion that he’d died to effect his plans, thus had already initiated the end times timetable. There are hints in the Dead Sea Scrolls that the sect(s) represented there did have some such view (and may even have written up pesher prophecies of that angel’s future planned death). But we don’t know that for sure, we don’t know if the only such sect simply became Christianity, we don’t know if any members of that sect protested the revelation and stuck to the original timetable and thus broke away, we don’t know if there were other sects never impacted by the revelation who continued preaching their own thing. Paul does say there were sects preaching “another Jesus” whom the Christians should shun. So those could have been any of the above, for example. there could well have been sects still revering or expecting the Jesus angel as not having died, and who (like possibly Philo) thought it absurd that he would ever do so, and/or who (like possibly the Qumran sect) thought it was not time yet for it to happen, who were competing with Christian sects. They could be the “other Jesus’s” Paul talks about. But we sadly just don’t know. Philo’s description of the logos does coincide abundantly with many of the most salient attributes assigned to the Jesus character and is presented as evidence that the existence of such a heavenly entity was not antithetical to authentic Jewish practice and belief. I agree. Philo’s commentary may reflect may reflect what others were thinking or be a forerunner of what was to come. The way Carrier has commented has left him more open for rebuttal that if he had been more propositional. The first believers in the Jesus savior cult were Jews, right? Hard to know … there are a number of possible permutations. “The most damning argument against Carrier’s claim is that there is no literary or archeological evidence within the entirety of the Mediterranean world and Second Temple period that validates the existence of this pre-Christian celestial Jesus.” Gullotta is correct. The early Christians (that is those at the very beginning of the movement) believed that the Messiah has appeared on earth in human form. That rumour at a time of existential crisis for the Jews – their religion and temple were destroyed – initiated the cult. Paul and others then proved that the “appearance” was genuine by recourse to the Jewish (and other) Scriptures. Fact: Philo’s angel is the same deity that the first Christians thought their Jesus was, even if Carrier is wrong about the name of Philo’s angel. Not yet proven: “Gullotta is correct”. If the experts moot the name of Philo’s angel, they may find that Carrier is not wrong. You don’t need to be an “expert” to follow the evidence. It’s that simple. Perhaps not, but there is evidence there was increasing expectation of a Jewish messiah-saviour. The only thing wrong with Carrier’s proposition is the degree to which he asserted there was concrete pre-Christian belief in an archangel name Jesus. Whether “The early Christians (… at the very beginning of the movement) believed that the Messiah has appeared on earth in human form” is debatable. It is possible there were several Christian cults with various celestial and various part of fully ‘earthly-saviour’ beliefs. Bird refers to an idealization of the Davidic dynasty or something like that we may call ‘proto-messianism’ and refers to 2 Sam 7:12-16, the Psalms, Daniel, and says Psalm 89 explicitly reiterates 2 Sam 7:11-16. Have a look at my own comments on such claims in the posts I linked. Bird repeats those common assertions for which I find scant evidence re popular messianic expectations in the early first century. This is an assertion. Evidence is needed to support the implication that a “radical reinterpretation” of scriptures was in any way connected with early first century messianic expectations. Examples are needed. We have no evidence that I know of for messianic paradigms taken up by anyone in the early first century. There were rebels, of course, just as there were almost anywhere else in the Roman empire. But that’s not “messianism”. Yes, there were different interpretations among certain sectarians. But it is a long step to infer from that that there were popular messianic expectations, let alone in the early first century. Yes, but see my previous comment. Same applies. Again, there is nothing here to support popular messianic movements or expectations in the time of Jesus. Those first two passages are just introductory ones, setting the scene. And, note Bird’s reference to Zech 6.11 which somewhat ties in with Carriers argument centred on Philo of Alexandria’s On the Confusion of Tongues 63, which evokes the notion of a messianic prophecy based on the high priest Joshua, son of Jehozadak, in Zech 6. I think you’re too quick to dismiss or sideline all that. Just reading an academic or scribal interpretation of scriptures tells us nothing about whether sectarians were actually anticipating a messiah at the time of Jesus. Yes there were different views of the messianic prophecies as there were different interpretations about many points in scriptures. None of the evidence Bird appears to have presented is any different from what I have addressed in the above posts — and it tells us nothing about sectarian expectations at the time of Jesus. If you think I’m too quick to dismiss the evidence have you yet read my posts addressing the evidence? @ https://vridar.org/?s=messianic+expectation Can you tell me where in those posts I am “too quick to dismiss” anything? As with Hurtado, one knows that any work of his will lo-and-behold prove the historical truth of some apologetic literalist belief in the gospels. There are two things Vridar has copiously demonstrated for me over umpteen years: that there is no consensus and precious few “experts”. In fact the only “expert” in command of a near totality of the relevant material appears to be Dr Carrier. The claim about Jesus not being an angle because angels had names like Michael is easily countered with the Enoch. Or rather, I would say that Jesus was not conceived as an angel, but as the Son of man. myriads and myriads, which would not be numbered. And anyway, the Son of man wasn’t an angel, he, along with the elect, were superior to angels and were to sit in judgement of them. At any rate. The attitude of Gullotta and others is clearly becoming all the more desperate. They try to dismiss things out of hand because the evidence is stacking up. In reality, when you step back and look at it, the defense that Paul was describing a real human Jesus has become absurd. In order to make such a defense it requires finely parsing a few cherished morsels, while ignoring broad themes in Paul’s writings. But if Paul knew that Jesus was a real person, it wouldn’t be a few sentences here and there that, if you look at them a certain way you can argue hat they are talking about a real person, it would have been evident all over his writings. The fact that his writings are so vague that we are even having this discussion tells you enough. There are dozens and dozens of places in Paul’s writings that one would expect him to have made clear statements about the real life Jesus if he had known that Jesus was areal person. The whole nature of Paul’s writings isn’t at all what one would expect from someone writing about someone who had just been on earth. Forget parsing tidbits, if a cult in the mid 1st century existed that was inspired by the life and teachings of a real person, and they produced writings that were trying to convince people of that person’s divinity, power, and wisdom, they would have produced writings radically different than what we see in the letters of Paul. Even Christian scholars admit that Paul was “not concerned” with the human Jesus, but Jesus as he lived in heaven. But the only reason this was not originally considered a problem was because the early church fathers all believed that the Gospels were written before the letters of Paul, and even though modern scholars now recognize that this isn’t true, they still act as if it is true. And it’s not just the letters of Paul, the epistle of James shows the same signs as do many other early works. So we go on with this charade that the fact that all the first writers about Jesus “weren’t concerned with his earthly ministry.” And this justification is actually taken seriously. I mean this is so stupid. So this guy was real, but the first people to write about him were unconcerned with his earthly existence, not even concerned enough to make clear note of the fact that God or his Son had actually taken human form. Yet, for all of the later Christians, who came along after the writing of the Gospels, the fact that Jesus was human was of the utmost importance! So even these scholars have to say, “For early Christian the fact that Jesus was human was totally unimportant, but for later Christians the fact he was human was of prime importance… and this makes sense.” I mean come on. This is basically the current state of accepted scholarship. When you really step back and stop parsing the nuances of Paul’s letters, the current scholarly consensus on the real life of Jesus is totally absurd. It’s hanging on the thinnest of threads, that can only be seen when you squint and look from a certain angle, and the fact that people claim this thinnest of threads is so meaningful is all based on maintaining a view established by traditions that are widely acknowledged as false even by the scholars trying to maintain them. The idea that Jesus was a real person would never have been established in the first place if the modern understanding of the New Testament works had been known from the start. Messianic hopes were highest just prior to the year 66, NOT during the reign of Tiberius. Suetonius records a fervent Messianic expectation during the reign of Vespasian. “A firm persuasion had long prevailed through all the East, that it was fated for the empire of the world, at that time, to devolve on some who should go forth from Judea. This prediction referred to a Roman emperor, as the event showed; but the Jews, applying it to themselves, broke out into rebellion.” p. 221 Jesus of the Books: A Pragmatic History of the Early Church. Once you get the basics right, that is the correct timeframe, it all falls into place. The expectation, the events all coincided at the time the Jewish religion was destroyed and naturally this is when (Jewish) Christianity, as a substitute religion, as a deviant sect of Judaism, was born. It did not succeed but its offshoot, Gentile Christianity as espoused by Paul and others, did. There were many names for God: 1) El, as Elohim, was one. But 2) Yahweh or Jahweh was another. Some might propose that Jesus’ name came from the latter. Meaning “Jehovah saves”?